VietJet will absolutely ensure a pleasant flight with their latest promotional display standee! We can see from the picture below that the brand optimize the space outside well. These outdoor standees are therefore perfect to reassure customers to put their trust into the brand. This is certainly a remarkable marketing tactic that many brands should consider! 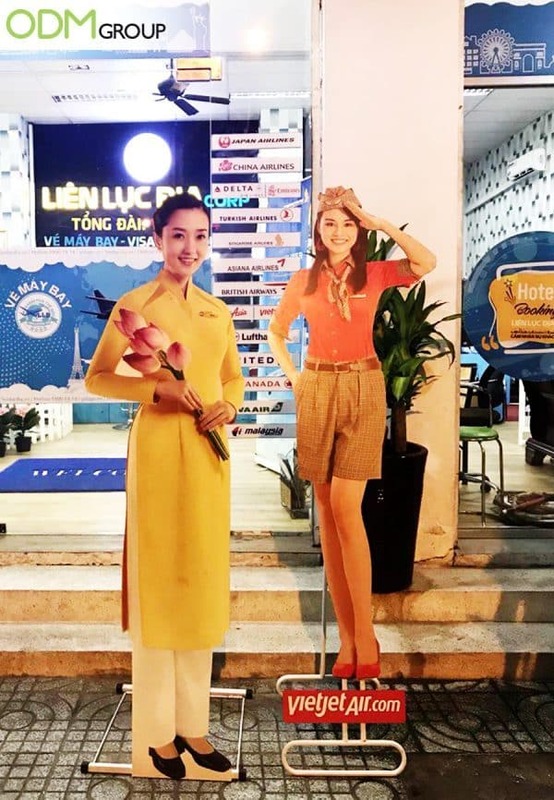 The standees portray the brand very well – an air stewardess and a Vietnamese dressed in their traditional costume. As a result, customers can clearly relate to the brand. How Does A Promotional Display Standee Benefit Your Brand? Customer Engagement – Display stands are highly preferred as they can easily get educate and relay information to customers. This builds a stronger relationship with customer and brand. With that, brand confidence and loyalty will definitely soar as brands see a growing customer base. Cost-Effective – The materials used, such as cardboards, to produce a promotional display standee are cheap and easy to produce. This helps brand to allocate resources for other usage, hence increases overall efficiency. Furthermore, the brand makes additional revenue while spending the least amount of money. This sure is a win-win situation for brands! Customizable – Being customizable means your brand is able to differentiate itself. The flexibility of design will therefore bring out a brand’s uniqueness and raise brand awareness. This retail display standee certainly manage to! Promotional display standee is really a great way to promote your brand at a low-cost yet being highly effective. At ODM, we specialize in product designing, brand design packaging and manufacturing high-quality promotional products. We have a team of product designers and merchandisers who can help you from product brainstorming session all the way through the actual sampling and production. Drop us an inquiry today! Beer Lao attracts event attendees with massive inflatable bottle! We can’t get enough of this Cool POS display by L’Occitane. It’s eye-catching and great for outdoor advertising.